The Saxton-McKinley house. 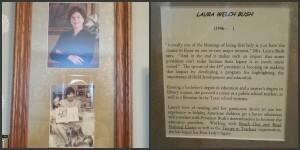 Image courtesy of the First Ladies National Historic Site. 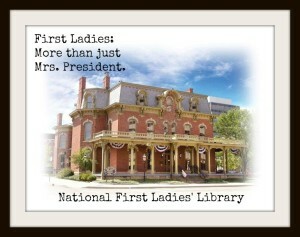 The National First Ladies Library is a great place to visit if you’re going to be near Canton, OH. I’ve lived in the area for almost 20 years now, but I’ve never been until a couple weeks ago. I feel kind of cheated now after getting to experience all that the museum has to offer and having such a great time. I didn’t even know the museum existed until a couple months ago! The National First Ladies Library offers a guided tour that is informative and interesting. The guide even dresses up as Ida McKinley, which adds to the fun! My personal favorite part of the experience was being able to see the architecture of the buildings included in the tour. The buildings are beautiful, and getting to see them is an experience all on its own! Unfortunately, the museum does not allow pictures during the first part of the tour. But the association was nice enough to send me photos from their own collection! Part of the collection at the National First Ladies Library. 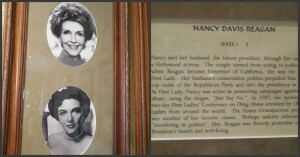 Photo courtesy of the First Ladies National Historic Site. 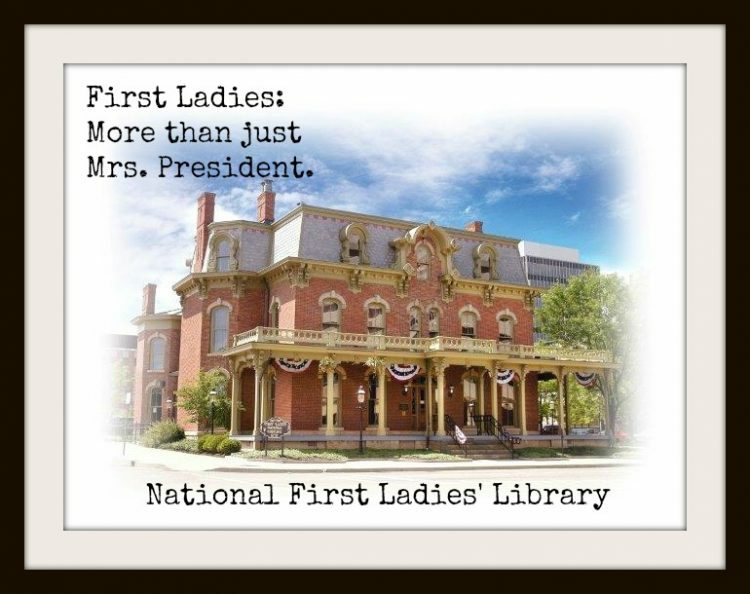 The National First Ladies Library is the only museum where information on all of the First Ladies, from Martha Washington to Michelle Obama, can be found. Guests can find everything from letters to clothing to personal items at this museum. There was very little information available on the First Ladies before this museum existed. Letters written to and from the First Ladies. Photo courtesy of the First Ladies National Historic Site. The tour of the National First Ladies Library starts off in the Education and Research Center, located inside of a renovated bank. The architecture of the building is mostly original. 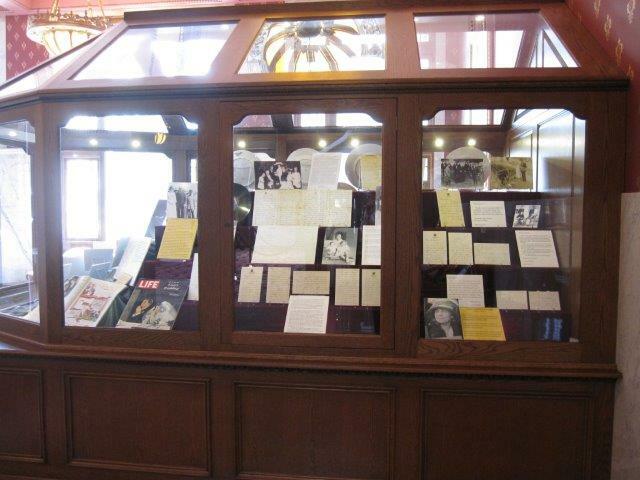 The beautiful cabinets that showcase the collection were created especially for the Library by a local craftsman. Like I said earlier, the architecture alone is a sight to behold! 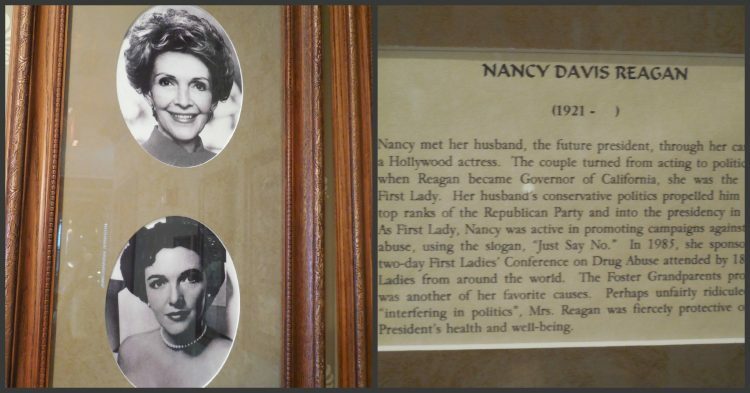 The museum was promoting their Mom-In-Chief exhibit when my family and I visited the National First Ladies Library. This exhibit “focuses on the everyday, private and special events between a mother and her children and how they become front page news while she fulfills her role as First Lady” (from the Mom-In-Chief informational brochure). Check out the Library’s website to find out what events and exhibits are available when planning your visit. 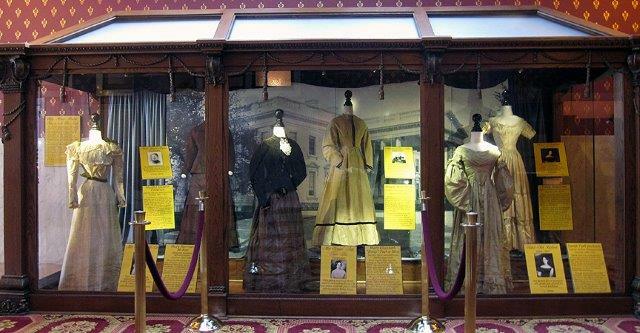 First Ladies’ dresses featured for the “Mom-in-Chief” exhibit. Photo courtesy of the First Ladies National Historic Site. Visitors are taken over to the Saxton McKinley House for the second part of the tour. This house is the only Canton residence with direct ties to William McKinley. 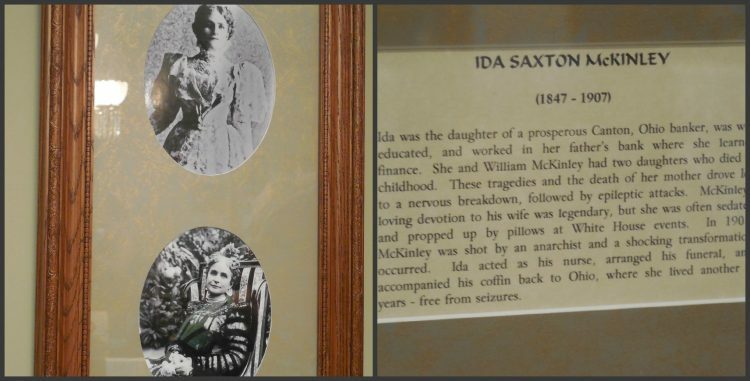 The house was the family home of Ida McKinley, William McKinley’s wife. As with everything in the museum, the house has a bit of a history. It went from family home to anything and everything and was even set to be demolished before it became the museum. Learning about all of the history behind the house makes for an entertaining tour, so I won’t spoil it all for you. 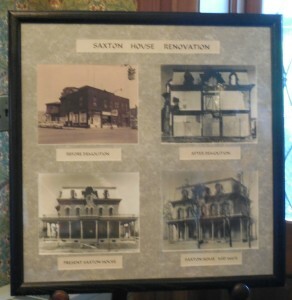 Some of the renovations that the Saxton House went through during its lifetime. 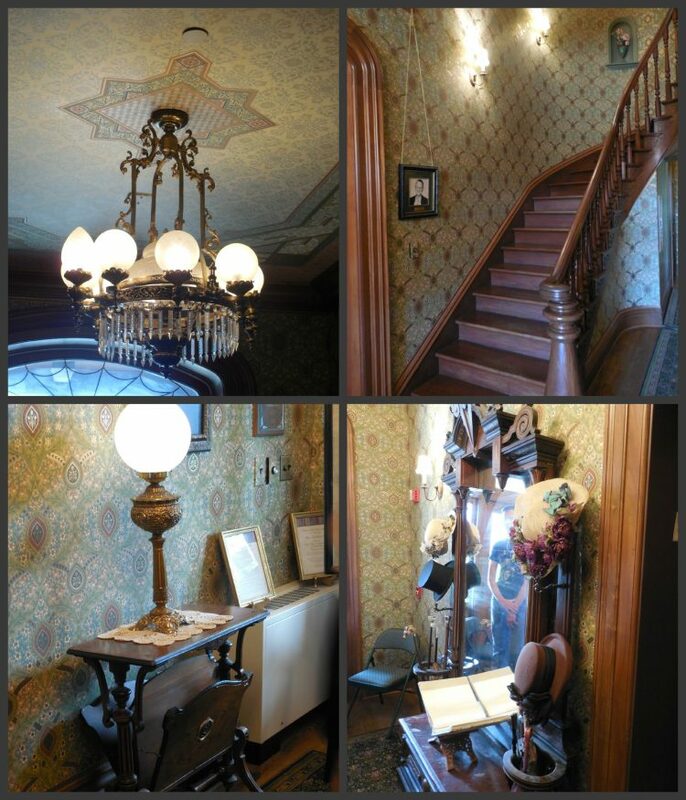 Top left: the light fixture in the Saxton House’s foyer; top right: the huge curving staircase that played a role in the restoration of the Saxton House; bottom left: a table and light in the Saxton House’s foyer; bottom right: mirror donated to the museum by the Smithsonian. 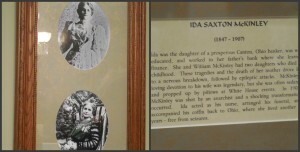 The tour of the Saxton House lets visitors see what the house might have looked like when Ida McKinley stayed there. Most of it had to be renovated and restored because it had been used for just about everything after it was a family home. The house hosts a collection of Ida McKinley’s furniture and personal items. Top images: the Saxton dining room and McKinley China. 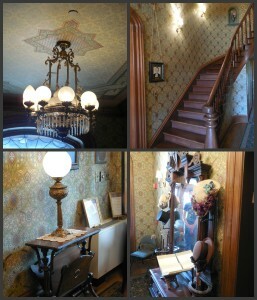 Bottom: the parlor. Visitors get a chance to see how the house might have looked when the McKinleys were staying there. 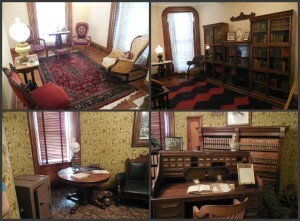 The bottom images show the study that William used. 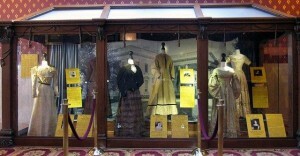 The restored ballroom, located on the third floor of the house, showcases images and information on each of the First Ladies. 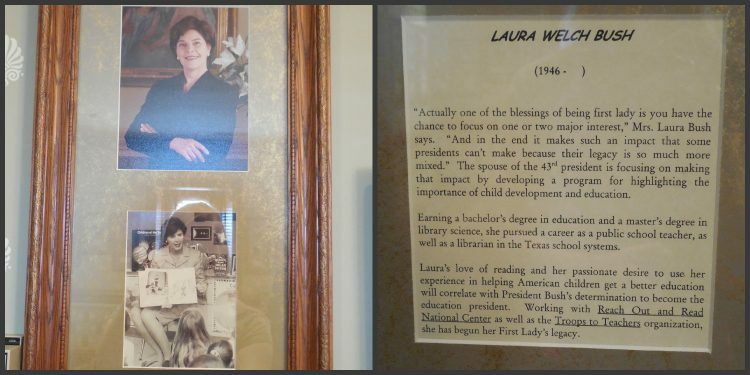 There is a “shrine” to each of the First Ladies, from Martha Washington to Michelle Obama. 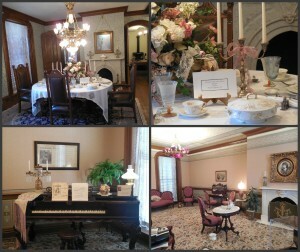 Some items that belonged to these First Ladies can also be found in this room, along with more of the McKinley China. 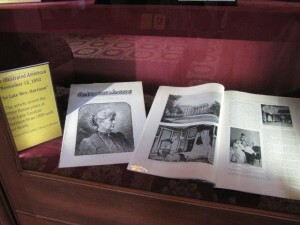 Some of the items showcased by the National First Ladies’ Library. I probably sound like a broken record, but I loved getting to see all of the architecture and hearing the history behind it. 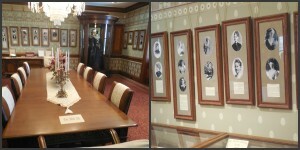 I also liked the room that hosts information on all of the First Ladies. Most of the stuff was “look, don’t touch,” as is usual for museums. I believe the museum is best for groups of mature individuals who like learning. I would not recommend bringing young children. For families looking for an educational field trip, I think that the museum is a good fit for ages ten and up. However, even my sixteen year old brother seemed less than excited about the tour. The good news is that tickets only cost $5 for everyone under 18! Adult tickets cost $7, children under 18 cost $5, and seniors cost $6. If you happen to have a National Park Pass, admission to the Education and Research Center is free, while tours of the Saxton House are $4. The National First Ladies Library is open Tuesday through Saturday 9:45 a.m. & 10:30 a.m. 11:15 am, 12:00 pm, 12:45, 1:30, 2:15 pm & 3:00 pm & plus Sundays in June, July & August at 12:45, 1:30 & 2:15 p.m. & 3:00 pm. The museum strongly recommends reservations, but only requires reservations for groups of 6 or more. 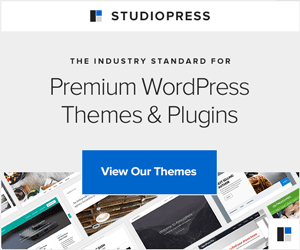 You can visit their webpage here for more information.